A cross-section of Twin Cities music vets have banded together to record a new anti-racism anthem, which they released today ahead of a white supremacist rally planned this weekend in Washington, D.C.
Memphis-reared blues belter Willie Walker – fresh off being awarded best male blues singer in Living Blues magazine’s critics poll – takes the lead in “Ain’t Gonna Whistle Dixie Anymore,” a song written by and recorded with Minneapolis troubadour Paul Metsa. Local gospel/soul choir Sounds of Blackness also lent their giant voices to put an exclamation point on the song. 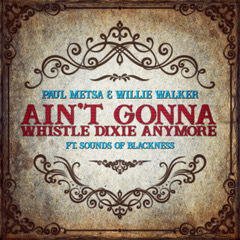 All proceeds from streaming and downloads of “Ain’t Gonna Whistle Dixie Anymore” will go toward the (racism-fighting) Southern Poverty Law Center and St. Paul’s High School for the Recording Arts, whose students were recruited to release a hip-hop version of the song that’s due for release in September. The lyrics (available in full here) go on to reference last summer’s white-power rally in Charlottesville, Va., which culminated in one rally member ramming his car at top speed through a crowd of counter protestors, killing one person and injuring 19 others. This weekend’s Unite the Right march in Washington, D.C., is being organized to mark the anniversary of that Charlottesville event. Here’s a promo video that Rock the Cause posted via YouTube to promote the single (a sample of which starts around the :30 mark).